A teenage blogger has been handed a prison sentence after he was found guilty by a Singapore court of "wounding religious feelings". 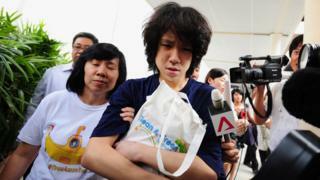 Amos Yee, 17, will spend six weeks in jail for deliberately posting videos and comments critical of Christianity and Islam. Judge Ong Hian Sun told the court that Yee's actions could "generate social unrest". It is the teenager's second prison sentence in two years. Yee was jailed for four weeks in 2015 for criticising Christians, and was accused of insulting Lee Kuan Yew after he posted a video online in which he likened the late Singaporean leader to Jesus Christ. Such actions are considered a serious crime in a country which takes a zero-tolerance approach towards insults of race and religion. Which way now for Singapore? Yee, who was accompanied to court on Thursday by his mother, told reporters that his sentence was "fair", adding that he was "very remorseful".